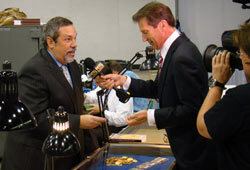 Michael Fuljenz (left), in Beaumont, Texas, is shown being interviewed about gold by FOX Business Network reporter Jeff Flock at the 2011 Chicago World's Fair of Money. (Philadelphia, Pennsylvania) – America's Gold Expert, Michael Fuljenz in Beaumont, Texas, set an unparalleled record of achievement at the World's Fair of Money in Philadelphia, August 7 - 11, 2012. 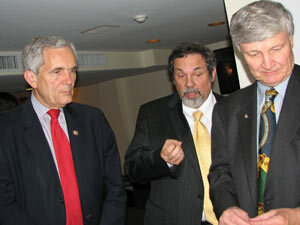 He received another six prestigious industry awards, continuing a string of honors and accomplishments at these annual gatherings of the world's top rare coin and precious metals dignitaries. The World's Fair of Money is an international event sponsored by the nonprofit, congressionally-chartered American Numismatic Association. Since 1986, Fuljenz now has won an unequaled 44 awards in 10 different categories from the Numismatic Literary Guild (NLG), a respected nonprofit organization composed of authors, editors and publishers who cover rare coins, paper money and precious metals. The esteemed awards are presented at the annual World's Fair of Money conventions, and Fuljenz set a record at the 2012 event. "No one else I can recall has ever won in so many diverse categories over the years," stated NLG Executive Director Ed Reiter, a former columnist for The New York Times. One of the 2012 awards is for Best Dealer Publication for Fuljenz' "Investors Profit Advisory (Personal Gold Guide)." This was the fifth consecutive year he has won in this important category. His expertise in the area of precious metals has led to numerous interview requests from local, regional and national news media over the years. You can watch a video of Fuljenz being interviewed by the FOX Business Network during the 2011 Chicago World's Fair of Money here: http://t.co/OJ5HGQH. You work for decades, sometimes 10 hours a day, save up your hard-earned money, and if everything works out, retire to enjoy life and put aside some of the stress. Law enforcement officers say a Jefferson county man victimized a woman who thought she was investing a quarter of a million dollars of her retirement money in legitimate company, only to learn that wasn't the case. The Jefferson County Sheriff's Office needs your help in finding a man who cost an 82-year-old California woman her retirement. Investigators say 26-year-old Bryson Cendejas ran a fake coin exchange company out of Nederland. An interesting article about a new United States Silver Dollar coin that honors our fallen and heroic servicemen and women. This is the perfect Christmas present that thanks those who gave everything for all of us.